If you are looking to buy property in Almuñecar, Costa del Sol, Spain then you will almost certainly need to find a list of Almuñecar estate agents (known in Spain as Almuñecar inmobiliaria). Almuñecar is a fantastic place to buy a property whether you want to buy a property for a holiday home or whether you intend to live in Almuñecar. 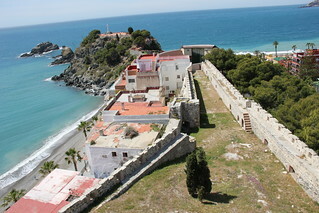 Almuñecar is a historic town (with beaches) situated on the Costa Tropical in southern Spain. Estate agents located in Almuñecar will also be able to help you find property in towns, villages, urbanisations and developments close to the Almuñecar area. These include: La Herradura, Los Guerras, Torre Caleta, Torre del Pino, Torre del Rio de la Miel, Torre de Maro, Velilla, Velila Taramay, Torre del Diablo, Alta Mar and Monte de los Almendros. Almuñecar estate agents and inmobiliaria have their own unique properties for sale but they can also show you other properties on sale from other property agents. If you want to buy a property in Almuñecar – the two estate agents will split the commission so the property you want to buy won’t cost you anything more. Try explain as specifically as you can what sort of properties and features you are looking for. View some properties and you should find that by the end of the day the agent will have more of an exact idea what to show you next as you give valuable feedback. If the agent shows you unsuitable properties then don’t waste your time – go to another agent start again. Look for a agent that takes time to listen to what you are looking for and who does not just try to push inappropriate properties for sale. If you want to know all about what it is like living in Almuñecar and the current property market, then you must read our in-depth interview with Martin Bright of Tropicana Estates on our main Almuñecar page. We select the best for you, ask our references, professional, trust, commitment. Put in good hands. C/ Huelva. Edificio Sofía – 18690 Almuñécar, Costa del Sol, Spain. Paseo del Altillo,6, Almuñecar, Costa del Sol, Spain. Plaza de Madrid nº 2, 18690 Almuñecar, Spain. Paseo del Altillo, 1 – 18690 – Almuñecar, Spain. Paseo de Andrés Segovia, 19 – 18697 LA HERRADURA – Almuñécar – Spain. Locally based property management team. Andaluz HOME Rental and Services, a successful property management company owned and run by Mette Line Sandborg and Susan Balaban. Based in Costa Tropical, Spain we provide all services for house maintenance, tourist license application, registration, guest reservations, key holding, cleaning and finally personally welcoming your guests to enjoy their vacation! Many of our home owners and guests are Scandinavian. Contact us if you want the same high service for your home rental or if you are looking to rent a piece of paradise for your next vacation! We have many apartments that are perfect for a long winter rental or a few weeks of sunshine. Estate agents in Almuñecar will view a property and give a guideline at which price to market the property however ultimately the owners decide at which price to sell the property for and some unrealistically overprice their houses. Estate agents in Almuñecar charge different commissions, expect typically to pay between 3% and 5%. If you are looking to sell your property in Almuñecar then we recommend going for an estate agent with an office in a busy location. An Almuñecar estate agent with an office demonstrates a degree of credibility and ensures they will have passing traffic. They will naturally also have an Internet presence also. Many estate agents in Almuñecar will also have houses and apartments for rent in Almuñecar. Do consider a long term let or rental in Almuñecar or rent a villa or apartment in Almuñecar as a way to get to know the area first. Most Almuñecar estate agents should also be able to help you with these services: finding apartments for sale or rent, villas and houses for sale or rent, townhouses for sale or rent, selling your property, letting your property, information on the local area such as amenities, facilities and schools, new build properties and resales, cheap bargain properties including repossessions and distressed sales, property maintenance, valuations, luxury properties, property finding services and arranging mortgage financing, Some agents will also handle commercial property such as shops to let or lease, bars and restaurants for sale and land for sale. Estate Agents in Almuñecar – Page Summary – This page contains unique content about estate agents in Almuñecar (known in Spain as Almuñecar inmobiliaria) as well as a directory of known estate agents in order to help people looking to let or buy property in the Almuñecar area.